eToro.com Review 2019 – Scam or Not? What does eToro.com bring to the table? People often mistake the website as an exchange platform but in reality, it isn’t. The website is an online trading platform where users are able to trade Crypto, ETFs, Stocks, Indices, Commodities, and (Fiat) Currencies with ease. 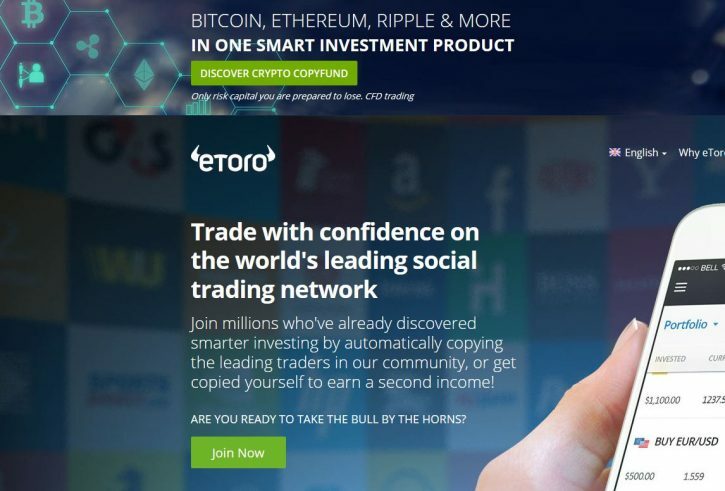 If you are big in the cryptocurrency world, then there is a huge chance that you might have seen eToro’s ads going around the internet today and might even have watched one of them. Today, we will be reviewing the website on the trading side and know how to get started, what their features are, and what services they offer on a general scale of things. Be aware that Etoro is a CFD Trading Platform – that means you pay with FIAT currency and you can not withdraw real Bitcoin or other crypto currency. You just trade the price of the coins, you never actually own the coins. No good review on the internet is without a little background history of the company you want to use a trading platform. Without further delay, let’s talk about that! The website eToro.com is based in Tel Aviv, Israel, and was founded way back in 2006. The company is regulated in Europe by CySec, where also many sportsbetting and casino websites are registered. They are also regulated by the National Futures Association or better known as NFA, and the Financial Conduct Authority or FCA. Listed on their website, they claim to have currently more than 5 million users in over 170 countries. With access to a huge trading market, it is not impossible to think that people would trade in this platform. One of the main reasons why they are attracting so many users is that they also act as a social investment network for traders. The “OpenBook” is the social investment platform that was launched in 2010 along with the ability to copy trades from a wide selection of registered users. You can still read more about the company and investment opportunities through their updated blog tab which can be accessed here. Different websites have different verification levels that act as umbrellas to protect a user and the company from unwanted trades. If you are familiar with trading platforms then a verification level is not new to you. For our new traders or people that are interested in trading, “verification levels” are there to regulate your trade. In simple words, you are not able to trade in huge numbers if your verification level is low and you need to unlock different tiers to trade larger amounts at once. Here at eToro.com, you do not need to go through the verification “levels” since you can start trading with a 2000 EUR cap! Of course, you need to be at least 18 years of age to open up a real money account in eToro and start trading. 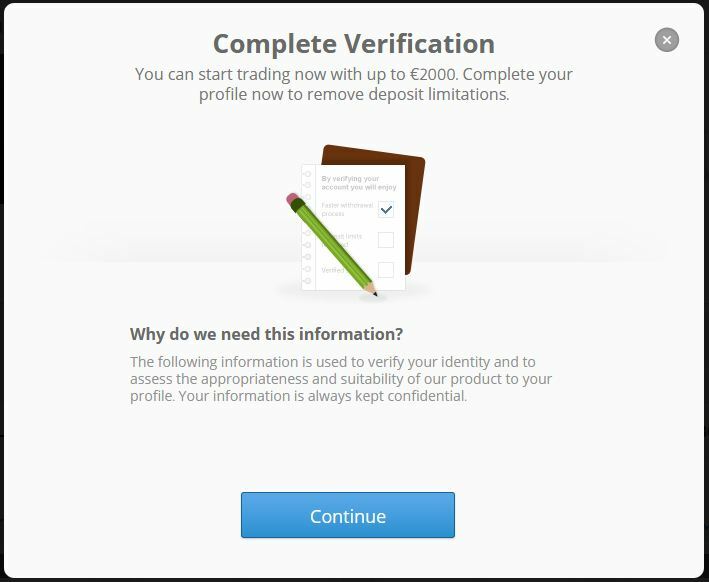 The verification process can be easily completed after an account is created with eToro.com. This can be done through the “Complete Profile” tab located on the upper left-hand side of the account dashboard. To get verified, please be advised that eToro.com would ask for personal information like your Government Issued ID, a phone number verification process, and Proof of Address. Full details of the account verification can be read here. There’s also a direct link to where you need to upload your documents on the provided link, so make sure that you go back to this review if you are having problems uploading your documents. The most important part of creating an account with eToro.com is completing your Profile. An account is not fully active if this part of the signing up process is not finished. Information such as having a degree in business is asked, how much you plan to deposit in a course of a year, and things like these needs to be answered. They also ask for your financial status as part of your profile. Why do they need sensitive information? This is to make sure that you are trading within your financial capacity and that it wouldn’t be a problem in the future. Completing the verification can also remove the deposit limitations being imposed on new accounts. In addition, it is really important to provide accurate information when entering required details as the system segregates the users in different levels. If you are new to trading, the system will warn you that copying trades is not possible due to the high risk involved. The company has an education program where you are taught the basics of trading, making sure that you understand each and every trade that is being made. Their social investment platform tied to their trading website is one great feature that not all trading websites have today. Virtual trading is also available in eToro.com. To start trading with their virtual account feature, a user just needs to create an account and switch from Real Portfolio to Virtual Portfolio with just one click! Copy People: The Copy People feature is actually famous and it provides new traders a priceless guide on how successful trades are being made without going through the trial and error stage. The “Copy People” page contains everything that you need to know about popular investors. In contrast to new traders, veterans can also choose to share their trades to gain fame and earn from sharing their successful trades. Traders that share their trades are categorized into different tabs for easy compilation of different Risk levels, Return percentage, and number of followers. To read more about copy trading, please click this link to be redirected to eToro’s guide. Referral Program: Up to 50 Million US dollars have already been paid to their top affiliates and the numbers just keeps on growing. This is because the website is not that hard to sell due to its friendly design and intensive educational materials. The referral program has their own support managers that will be able to help an aspiring partner in the future. They also have detailed reporting that will be useful when it comes to getting projections on where you are currently at. To read more about their referral program, please click this link. They also have an App where you are able to trade and invest in the global market on the go! We found a two-year-old video about their App which you can view below. As mentioned, there are limitations depending on where you are from when it comes to deposits. For an example, let us take the UK. If you are from the UK, it would only take an instant for the funds to reflect in your account without any problems. In other areas of the world, this would take up to five days. Anyways, the maximum deposit per transaction of a UK based user is $20,000 and will be regulated by the FCA. You can read more about their deposits here. Withdrawal requests are only possible if the required information needed is provided. In addition, the time needed to receive the withdrawal may vary depending on the method chosen. All of the time taken to receive the funds can be read here. Regular estimated time runs around 1-5 working days. Not bad compared to other trading platforms that would reach two weeks. After all the talk of their history, features, how to deposit and withdraw, we think it is appropriate to talk about trading and how to start a trade with eToro.com. First, we need to log into our account and go to our user dashboard. On the screenshot provided above, users can see the important parts of the account. We’ve got the trade market tabs located on the upper part of the account page. We can see that there’s the Crypto Currency tab, followed by the ETFs and etc. The panel located on the left-hand side of the page has a little button (underneath the username and picture) named “Real” since the default page should show your real money account. Click on the “Real” button and select “Virtual” to start trading with virtual currency. For the benefit of everyone that is also trying their website out as they read our review, we will be using a virtual account today for the demo. Having a virtual account accessible any time is one of their great features available in eToro.com. What’s great about their virtual account is that everything that you have access to in a real account can be done with their virtual account, making learning a fun experience! Shown in the screenshot we’ve got the DISCOVER tab wherein Trade Markets, Copy People, Invest in CopyFunds can be found. Below that, under the MORE tab, we’ve got the most important tab on this website, the “Guide” tab where you will be walked through their website by following prompts. To start a trade just click on the Trade Markets tab located on the side panel and select which market is interesting for you to try out. For this demo, we are going to select Crypto. In order to do that, just click on the Crypto market located in the upper part of the dashboard. After clicking, you will be redirected to a page just like the one shown in the screenshot above. The screenshot shows the squared part wherein the BUY and SELL buttons can be found. One thing to note is color green and red buttons. This means that Crypto is doing great against the US Dollar if it goes green, when it’s Red this means that it is doing badly against the US dollar. On the page shown in the screenshot above, you are able to choose between BTC, DASH, ETC, ETH, LTC, and XRP. Buying and selling are very easy! You just need to click on the Crypto that you want to trade and a separate window will be provided. On the buying/selling tab, you are able to select how many units you are going to buy/sell or change it to the amount you are willing to trade. This page also contains information about the trade in general like how much leverage is being provided, and the stop loss and profit can also be viewed here. Everything can be tweaked for the perfect trade and once the adjustments have been made, click on “Open Trade” to start the trade. 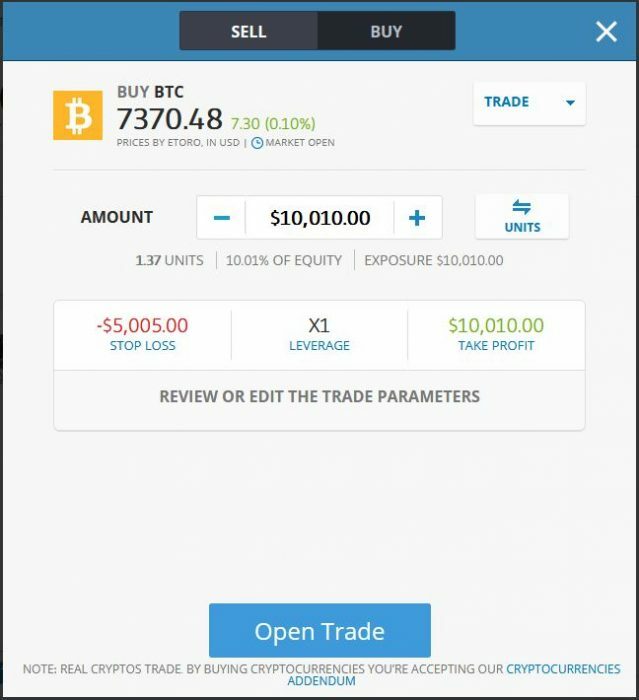 Once a trade has been successfully placed, this will show up under your Portfolio which can be found on the left-hand side panel shown in the screenshot above. Here you are able to open a new trade, close trades, view charts, and set new price alerts for your convenience. Their trading experience is really easy and refreshing compared to the cluttered trading platforms that exist today. The simplicity and full support when it comes to providing guides and educational material about trading are just great! The website interface is just perfectly coded and designed. This means that when you are browsing through different tabs, you will not be able to experience unwanted lags and delays between loading screens. Their “Guide” tab is great for people that want to learn how to navigate the website by just following the simple instructions. Aside from being CySEC, FCA, and NFA regulated, eToro makes sure that all information gathered from their registered users is kept safe. Their website uses SSL technology for data transfers and your mobile device connected to the account can be of great use for future confirmations. In addition, under the account settings, you can either choose from a private or public profile. A public profile makes other users view your trading data, be copied, be searched, and appear on people’s discovery. Having your profile under private eliminates all the mentioned features above and you are able to keep everything private, plus you are able to copy trades without any limits. eToro’s customer care channels are available 24/5 from Monday through Friday. You can reach them by telephone or email. It is odd that eToro.com doesn’t have a live-chat feature installed on their website; maybe this will be implemented in the future. Information about their physical address can be found on this page. There’s a lot of talk about the website not being able to keep up the end of their bargain and that is to release user’s funds into their selected withdrawal options. But we started to dig through these accusations and only found out that most of them are just misunderstandings with their verification process, ID uploading problems, and things like that. In general, eToro.com, in general, is doing great when it comes to withdrawals. The hardest part of this review is looking for the flaws this website have.The only flaws that we’ve found would be their lack of payment options, limited coins listed and not having a live chat, aside from these mentioned, everything is awesome! One thing that we’ve noticed on the short tour we’ve been through their website and trading platform is that everything is neatly placed where it should be and definitely not cluttered compared to other websites that offer the same services as they do. Everything in eToro.com has a purpose and the design of the website is also pointing to that direction. The educational material available on this website is just outstanding! From videos on how to make a successful trade, to interactive trading courses, everything is taken one step at a time making it easier for new traders to love their website and get hooked in no time. Their social network capability is one of a kind and is also one of the trailblazers in the industry when it comes to combining social network and trading into one. All-in-all the website is solid and there should be no problems whatsoever for new traders to explore and learn about their website! It actually says that clearly in the cons. I recommend to read the article. 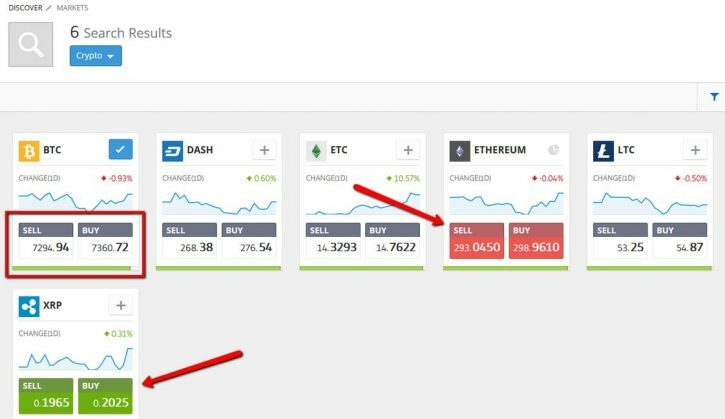 You do not mention that on Etoro you don’t really trade the asset (you don’t own it) as in the real stock market or crypto exchanges! You are hiding the real issue with eToro. eToro is solely offering trading with CFDs ! Meaning no real coins or ETFs or Gold or whatever is traded. Only CFDs. This is very risky compared to real exchanges. The other issue is that only FIAT is going in and out. Meaning that you always have to trade back your CFDs to Fiat, before you can cash out. Cashing out has high costs. Also, crypto wallets will be neither on the eToro platform nor can you transfer cryptocurrencies from or to EToro. eToro in my opinion is a gambling platform, nothing else. If you can’t deposit or withdraw crypto it isn’t proer exchange and should be removed from this listing. With these very volatile and unpredictable prices in bitcoins, only wise people trade (sell or buy) bitcoins at lesser rates. That is why I left other platform and choose furcoins Be wise too and save cost.